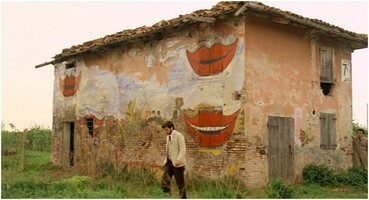 Stefano has taken a job finishing a fresco at a church on an isolated island somewhere in Italy. I had high hopes for this film by Pupi Avati when Stefano got off the boat and set foot onto the island since there was a sultry broad making eyes at him and a midget greeted him on shore. 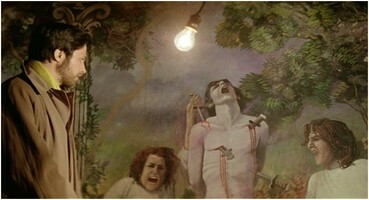 Unfortunately, Avati shows us the embryonic stages of his uniquely dull style with The House of the Laughing Windows, though he does trick the viewer with the lush scenery and the mounting mystery of what strange things are going on at this church and the fresco for a little while. Naturally, the pay-off for all of this is fairly stupid and prompts lots of shoulder shrugging, but at least you got to see plenty of green fields, water and old houses along the way. So what’s the deal with this painting? The old artist disappeared and never finished it. The picture is of a saint getting stabbed by a couple of chicks and it really isn’t very good, but Stefano figures a job’s a job. As might be expected on an island run by a midget mayor who thinks that a painting in a church of a dude getting hacked up will jumpstart the tourist trade, strange things begin occurring. First of all there is Stefano’s buddy. This guy keeps getting ready to tell Stefano something about a house and the first painter, but is always interrupted and finally gets himself tossed out of a second story window to his death. Stefano also gets prank calls telling him not to finish the picture. He sees strange flowers in the church that he saw someone else pick earlier. He hears threatening voices on a tape machine. And there’s the strange altar boy that pedals around on his bike with a container that he won’t tell Stefano what it’s filled with. It’s all very intriguing, if exceptionally tortoise-paced and you’re hoping for more details so that you can figure out what is going on. The film though takes its own sweet time doing much of anything and when it does something, it’s not exactly news-flash material. Stefano getting kicked out of his hotel room for a guest that doesn’t exist? Odd, but not really riveting. Once Stefano is kicked out of his hotel room, the altar boy sets him up at his old, run down place that is also inhabited by a bed-ridden old woman. The yawns keep coming as we get to watch him move his school teacher girlfriend in there with him. Avati has no choice toward the end of the film, but to add some action to things. You could tell that this goes against his general nature when we get not one, but two digging scenes. 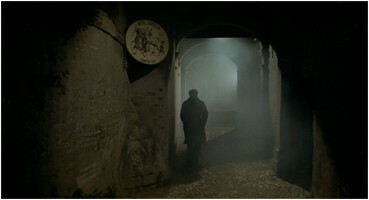 The remainder of the movie is Stefano stumbling around town with a little stab wound, trying to get help, but the only person who will answer his pleas is the priest at the church where he was working on the fresco. The priest turns out to be a refugee from one of those Tom Cruise Mission: Impossible movies which allows the film to have one of those shock endings that is required under Italian law. 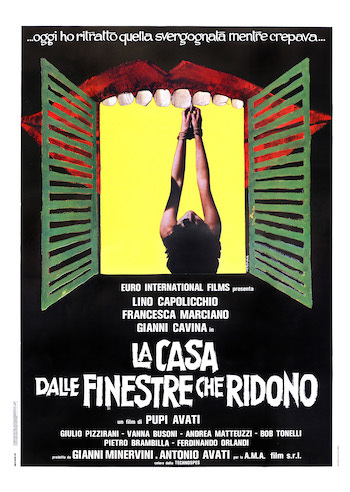 The movie could be called an interesting departure from the entire Italian giallo movement, except that the more the movie plods along, giving the minutest tidbits about things, the less interested you become. It wasn’t particularly scary and Avati underplayed everything in the movie so that you weren’t even jolted by musical cues, which is usually de rigueur in Italian horror flicks. Another big problem with all this restrained-to-the-point-of-non-existent terror is that Stefano fails to engage us on any level. He shows up to paint, sticks his nose in the other painter’s business, and beds every girl under thirty on the island. Other than being a nosy stud, you know little about who he is and the guy who plays him does so in a completely disconnected way. He just wanders from odd occurrence to odd occurrence, never demonstrating any reason to like him. It felt like I was watching a stranger even though I spent almost two hours with him. An overrated, uninvolving affair, that felt like it should have been a lot better. It’s highlighted by the great location shooting by Avati, but what you are ultimately left with is a surprisingly nice looking film that eventually chokes on its own atmosphere.